We are excited to announce that the Founder Institute will be awarding an Imagine Fellowship to the most extraordinary applicant from the Imagine Creativity Center, giving them the opportunity to enroll in the Founder Institute for free! The recipient will be recognized as somebody with the utmost potential to become a successful technology entrepreneur. In order to be eligible for the Imagine Fellowship for the Barcelona Autumn 2014 Semester, you must complete your application and Admissions Test by the early Admissions Deadline of 11:59 PM on 2014-09-28, using this link. Anyone who follows those guidelines will be automatically eligible – no further steps are required. The Founder Institute is the world’s largest entrepreneur training and startup launch program, helping aspiring founders across the globe build enduring technology companies. In their four-month, part-time program, you can “learn by doing” and launch a company through structured training courses, practical business-building assignments, and expert feedback. Today the four finalist teams to win the Banco Sabadell Contest (School Year, HealthAdvisor, Vincles, and Trip4Real) presented their apps to a jury at Banco Sabadell. Once again, they impressed everyone with their hard work and creative ideas. 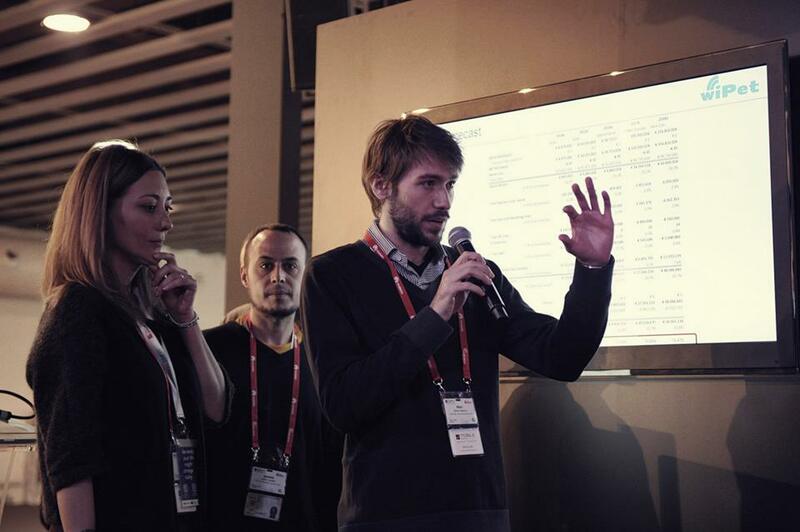 Their challenge was to translate their app into a financial app, and again only in 6000 minutes! After a hard deliberation the winning team was announced, School Year. Congratulations Tomás Ferrándiz, Fernando García and Jordi Boza. 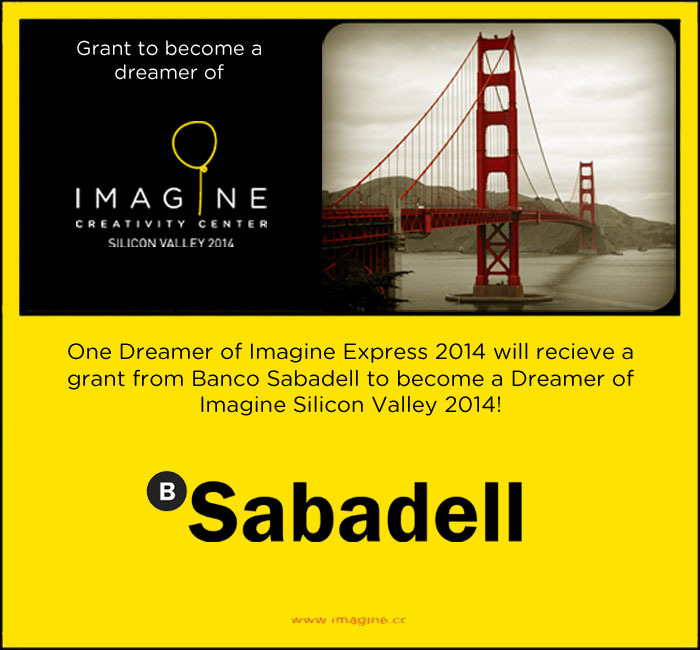 Banco Sabadell and BStartUp will give a grant to one of the members of the team to become a dreamer of Imagine Silicon Valley 2014. This dreamer will spend one month working in Silicon Valley and visiting the most innovative companies in the world! Congratulations School Year! Congratulations to all the participating teams for your amazing work! 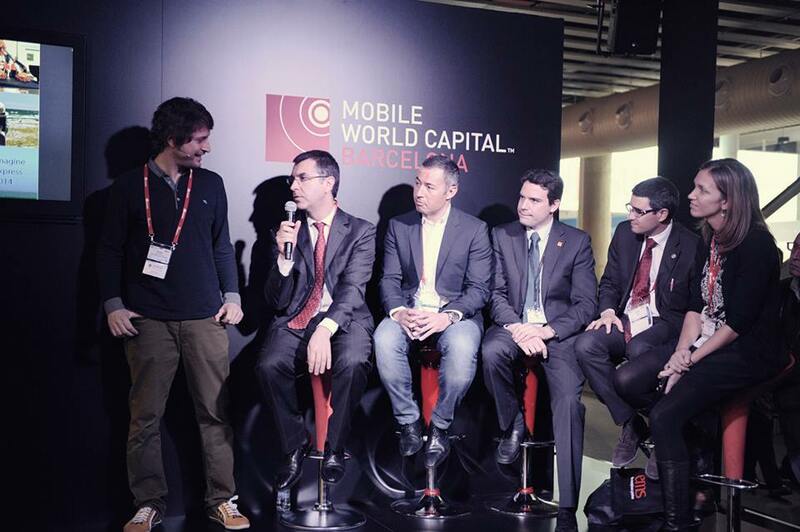 On the 28th of February the 4 winning teams of Imagine Express 2014: WiPet (Open), Trip4Real (Tourism&Culture), Vincles (Social) and Phisious (Health) presented their projects at the Mobile World Congress in Barcelona. 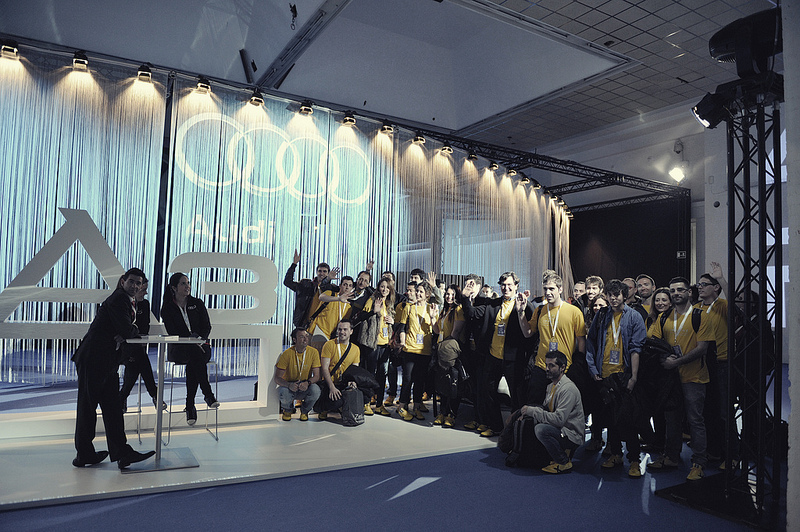 In this event the 4 winners were competing to win the Audi Innovation Prize. 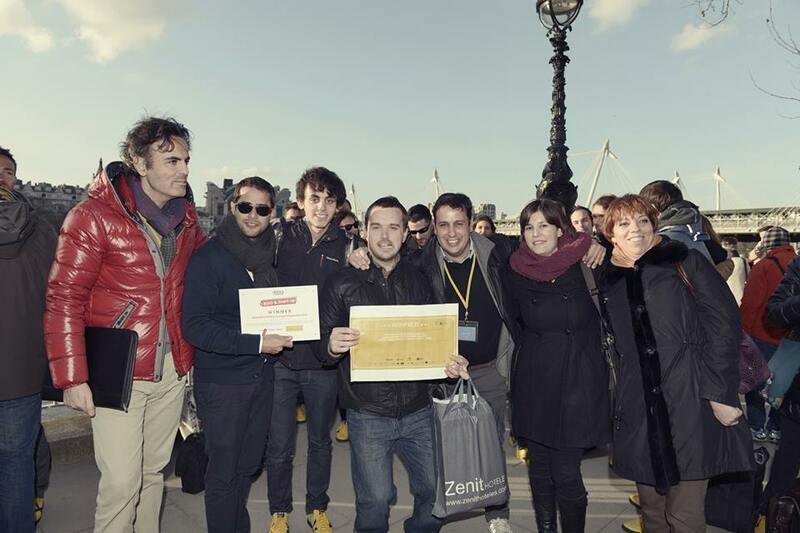 a prize that will take the winners to work during one week to Silicon Valley! We would like to thank the judges that accompanied us during the event (from left to right): Guillermo Fada (Director Audi España) , Jaime Jiménez (SVP B2B of Softonic) , Albert Carné (Northwest Territorial Resources Manager at Orange) , David Ferré (Member of the board at College of Telecomunications Engineers “COETTC”) , Julie Chrysler (Global Marketing and Student Advocacy at Cisco Networking Academy) . We are aware of the though decision they had to make, thank you very much for your help! After a very hard deliberation, the winning team was chosen: WiPet. Congratulations Ignacio López, Marc Mateu, and Natalia Dominguez . We will see you very soon in San Francisco! Once again, congratulations to all the participating teams! You energy and talent is truly inspiring to all of us ! 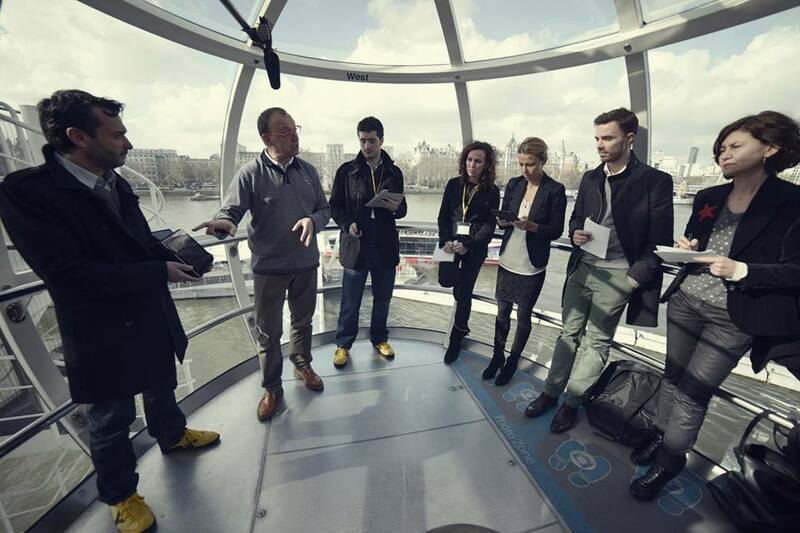 On Wednesday 26th of February the 12 teams of Imagine Express presented their projects in front of investors and experts at the London Eye. From the Imagine staff we would like to congratulate all the teams for their amazing work, all the members of the jury were amazed by everything they had achieved in only 2 days. 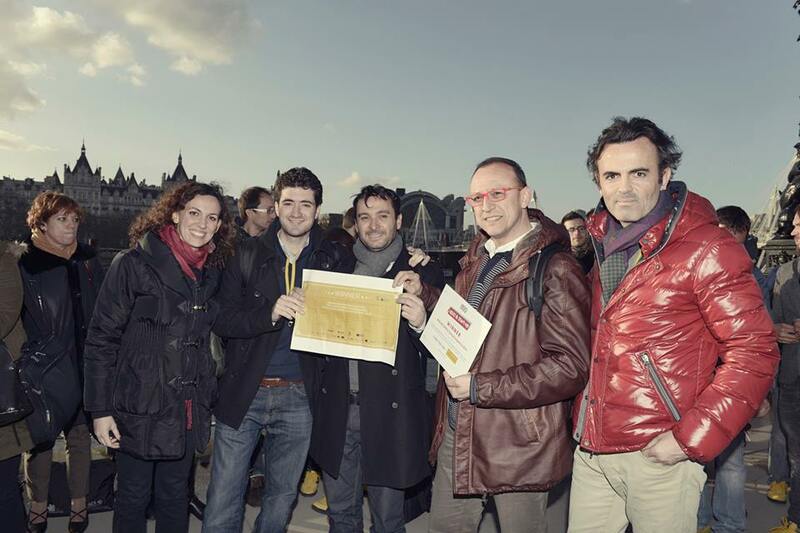 It has been spectacular to see how the teams have worked together to create extraordinary projects. 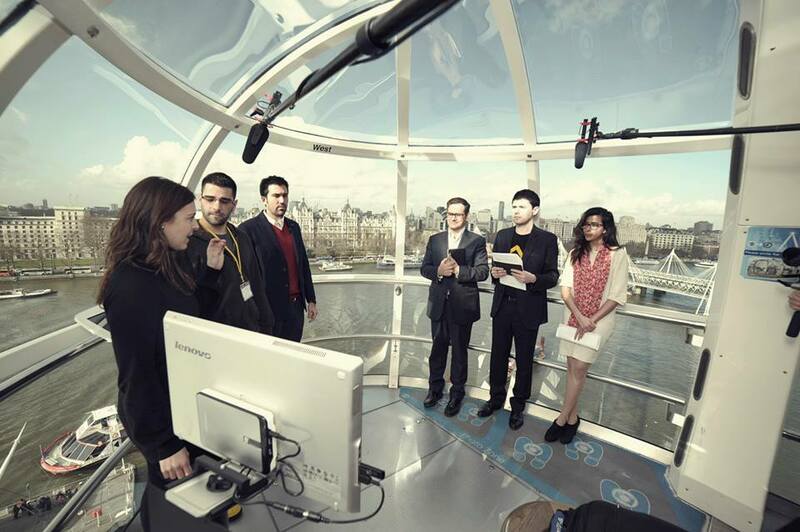 The teams entered the London Eye cabins by categories, three teams where competing in every category: Open, Social, Tourism&Culture, and Health. From each category the judges chose one final winner. 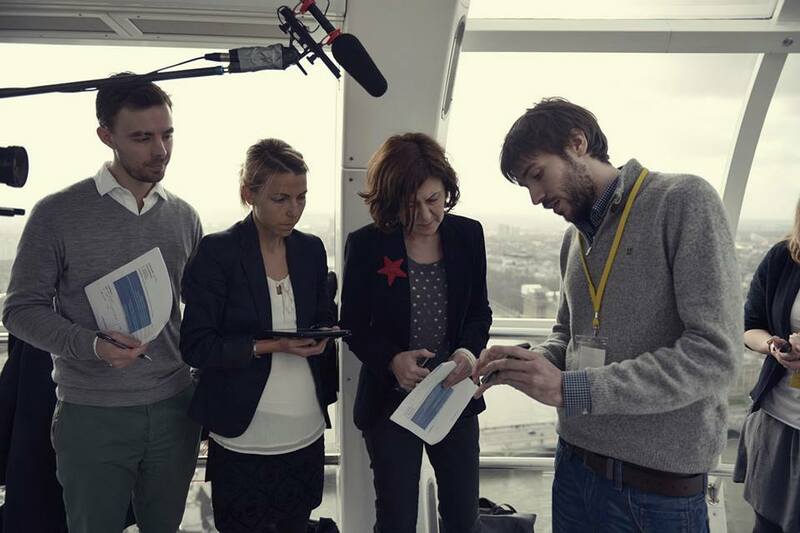 The choice was not easy, the jury members had a very though time making the decisions! 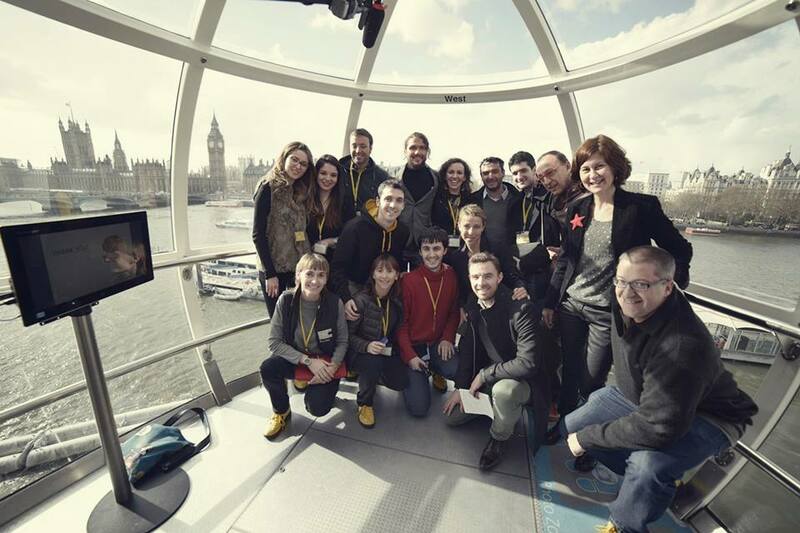 We would like to thank Yolanda Perez (BStartup), Ignacio Fonts (Inveready), Itxaso del Palacio (EC1 Capital), John Henderson (White Start Capital), Sofia Hmich (Index Ventures), Arturo Calvo (Dialective) and Clara Navarro (shi2b) for joining us in this great adventure! Congratulations to all the participant teams, what you have all accomplished is incredible! You are all winners! 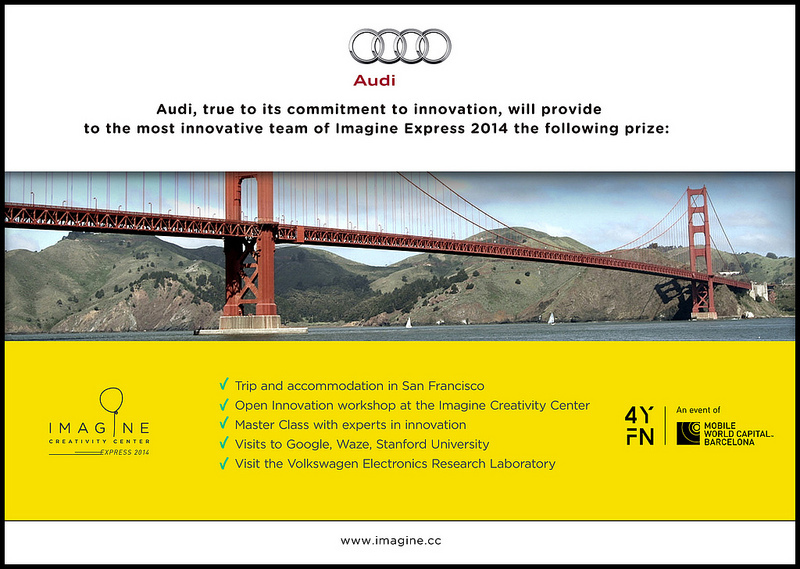 El evento final de Imagine Express 2014, Hacktrain organizada por el Imagine Creativity Center San Francisco junto con con la Barcelona Mobile World Capital tendrá lugar este Viernes 28 de Febrero en el Disseny Hub de Barcelona. 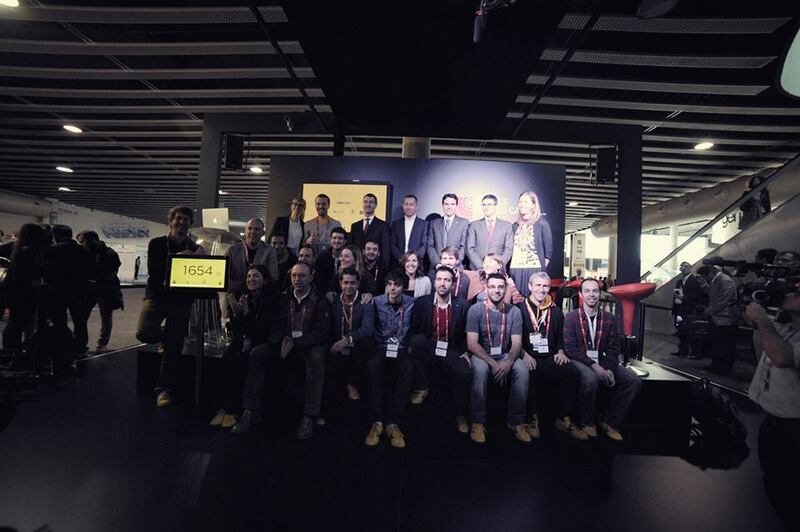 Durante el evento de presentaran los 12 proyectos que se han trabajado durante el viaje Barcelona-Paris-Londes-Barcelona. In the Projects section of our website you will be able to find the 12 projects our Dreamers will be working on during the Imagine Express Program. Each project has it’s own microsite which our teams will be updating throughout the journey. To create these microsites, we have used the mobile prototyping tool from Concept Inbox, a tool developed by Oscar del Río (dreamer of Silicon Valley 2011) and his amazing team. Concept Inbox is an all-in-one visual collaboration platform for designers and other creatives that gives them the suitable tools to work together without meeting face-to-face, saving a lot of time. Concept Inbox provides great communication tools that allows you to comment and give feedback on the graphic files to get the job done quickly. Marc Mateu Mateus is finishing Telecommunications Engineering at UPC. Bioengineering has always been one of his passions, and also all kinds of technology, in particular themes related to healthy habits. Currently, he is working in two bioengineering research projects in the Department of Electronic Engineering in UPC, which are Healing Drop (inside the project: INNPACTO de la Secretaría de Estado de I+D+i adscrita al Ministerio de Economía y Competitividad) and a project from RecerCaixa, where he develops software in iOS platform and also different types of dedicated servers. In this projects they try to monitor the habits of the patients by controlling, among other things, user’s respiration in different positions and places, and telling him if he is sleeping or not by analysing his respiration patterns. In addition the app monitors the patient cardiac pulse with dedicated hardware (Polar Band with Bluetooth Low Energy) or by placing the finger on the device camera and processing the video feed. All this software is been developed to improve or maintain the healthy habits of the users, with the help of this apps. On the other hand, he has collaborated in the design and implementation of data acquisition in the cardiac pulse bluetooth sensor of the recently launched app FitLab Free by Health&SportLab. For two years he has worked in Col·legi Mayor Penyafort-Montserrat maintaining their networks and all their informatics equipments, including their web page. He is also working in a project for the col·legi, that consists of a smart parking. He is currently developing the remote processing server and the integration of this systems to the Internet. Finally, he has advanced knowledge in different programming languages, that include: objective-c, java, c… Several types of relational databases: MySQL, Sqlite, CoreData and different types of computational programs such as Matlab and Omnetpp, as well as php5 and html5. The Col.legis Majors Penyafort-Montserrat-Llull of the University of Barcelona are centres where are housed annually around 650 students enrolled in varying degrees at universities in the city. The institution aims to attract the talent and help promote it through cooperation between not only the students living in a given year but also between those who have lived in the College in the past. All of them belong to a network that provides students access to the working world and allows businesses the recruitment of young talented professionals. The main fact that describes the Col.legi Major is interdisciplinarity, which allows an exchange of knowledge and points of view that, for example, has recently resulted in the installation of a smart parking in Penyafort premises, in which 10 different students of several ages have collaborated. Lufthansa AirPlus is a key provider of savings to over 40,000 customers worldwide through a suite of business travel payment solutions which include central bill accounts, corporate cards and online management tools. AirPlus is travel agency neutral, the leading issuer of UATP worldwide and the preferred partner of various airlines such as Austrian Airlines,, Air China, Lufthansa German Airlines, Luxair, Singapore Airlines, Swiss International Air Lines and TAP Portugal. For more information, please visit online at www.airplus.com. Today, February 20th, the last 6 dreamers to win a ticket to Imagine Express have been chosen in a competition that took place in a public event in Barcelona at Auditori Macba. The event start out with a Face Off between two developers: Android vs. iPhone. Both developers had to program a small application in front of the eyes of over 200 assistants. Congratulations for your courage Alex Chimeno and Òscar Cardona. They both proved to everyone their expertise, finished the challenge and where evaluated by a expert in app development, Nacho Sánchez. Since they both did an amazing job, and to reward their bravery, they have both been awarded a ticket to Imagine Express 2014. Welcome on board! 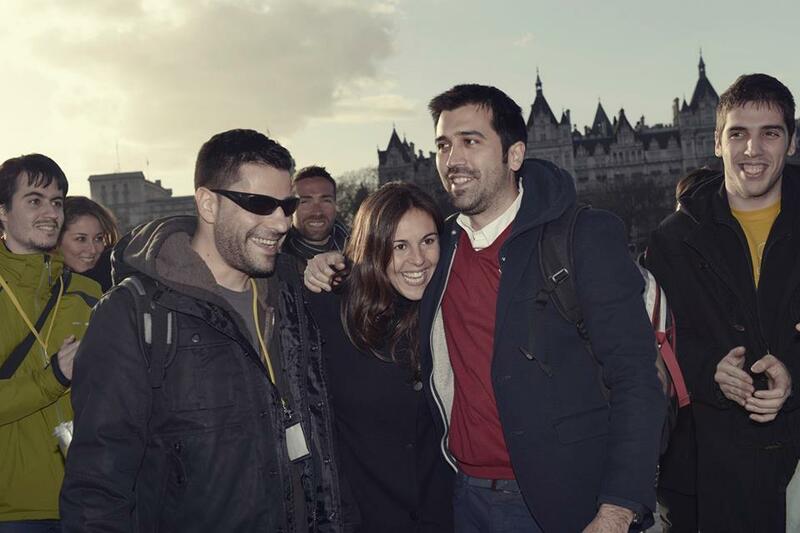 Carme is a young professional experienced in a multicultural environment in the framework of quality assurance. She is passionate about her work, as it gives her the opportunity to provide to patients products with the required quality; it’s all she has ever wanted to be and do. Carme has an entrepreneur mind, focused on searching for new opportunities, changes and she’s deeply committed with everything she does. Carme has a degree in Pharmacy, a Master in Pharmaceutical industry management at University of Barcelona and a Graduate in Business management at IEDC Universitat Pompeu Fabra. Sanofi, an integrated global healthcare leader, discovers, develops and distributes therapeutic solutions focused on patients’ needs. Sanofi has core strengths in the field of healthcare with seven growth platforms: diabetes solutions, human vaccines, innovative drugs, consumer healthcare, emerging markets, animal health and the new Genzyme. Sanofi is listed in Paris (EURONEXT: SAN) and in New York (NYSE: SNY). Sanofi operates in more than 100 countries worldwide and has around 110.000 employees. In Spain, the company has around 1000 employees, two offices in Madrid and Barcelona, a distribution center in Leganes (Madrid) and a production center in Riells i Viabrea (Girona).